The E97-F design incorporates air conditioning, NBC filtration unit, differential pressure sensor and over pressure relief flap in a fully integrated self contained package. 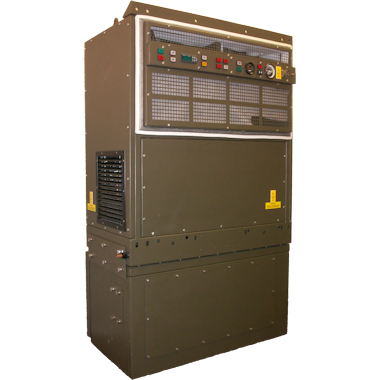 The components (ACU & NBC) are designed to either mounted together NBC filter, slung under the Air Conditioner, or mounted side by side on the external wall of the shelter. Particular attention has been paid to ease of installation and maintenance. All components are readily accessible with the unit in-situ by the simple removal of servicing panels. To satisfy the demands of modern radar and computer controlled system, special consideration has been given to EMC and RFI suppression. When RFI seals and honeycomb filters are used with the electrically bonded case, a high level of attenuation over a wide frequency spectrum is achieved. Capacity control is standard feature to eliminate the power surges associated with compressor starting. Temperature control is selected through a programmable temperature controller. Once selected the operation of the unit if fully automatic with cooling available in ambient conditions from -46ºC to +55ºC. Performance and fault monitoring, self test and remote alarm signals are provided on the unit control panel via illuminated push buttons and indicators. When NBC filtered air is required, the unit will automatically seal off the fresh air intake, divert the fresh air through the NBC composite and then conditioned before being mixed with the air circulating within the conditioned space. Assuming the installation is well sealed, the E97-F will create a safe working over pressure before the internal pressure flap operates to exhaust stale air from the conditioned space.